I confess...I'm completely obsessed with apples right now. Matt and I have a fruit bowl and the apples are definitely taking over. The bananas...well they are sitting next to the fruit bowl and have probably felt neglected recently. I even found an uber ripe banana in the bottom of the fruit bowl that hadn't been eaten. oops! I quickly cut up the banana and put it in the freezer. Luckily, bananas freeze very nicely. A couple months ago I posted an applesauce recipe. Having made a couple more batches and eating it all, I decided to turn my next batch of applesauce into apple goodness butter. 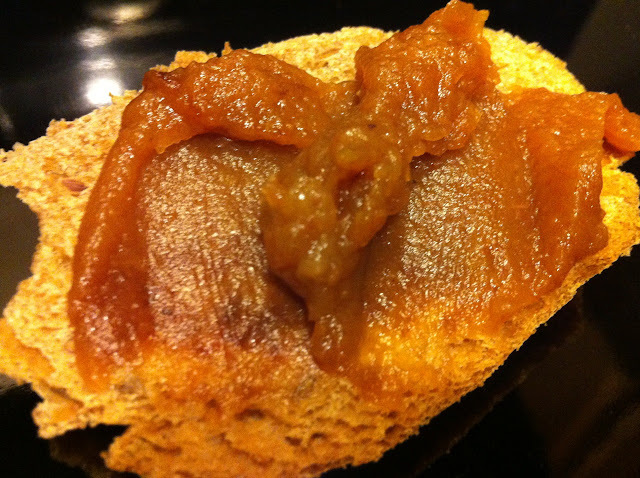 Yes, apple butter....spreadable and delicious on bread, in oatmeal or just eaten with a spoon right out of the jar. 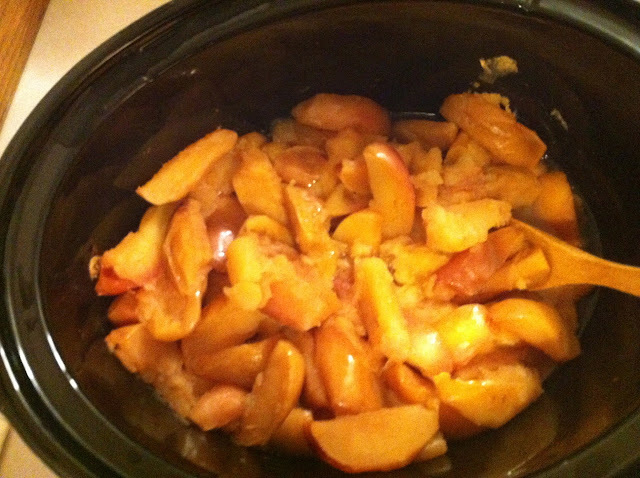 Core and slice apples and put in slow cooker. Heat apples on low 8-10 hours or until apples become soft. 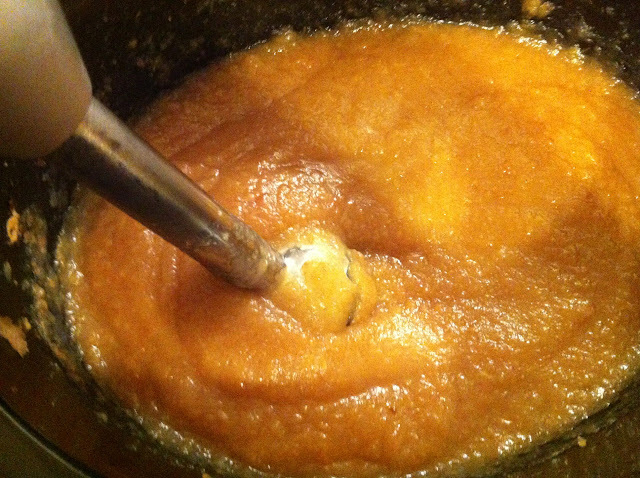 Blend with hand held immersion blender or food processor to smooth out the apples. Add cinnamon and lemon juice. Replace lid and cook on low for another 10 hours (consider going to sleep). 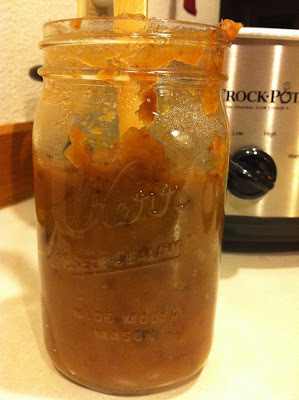 When I made the apple butter, I didn't feel like peeling any apples. 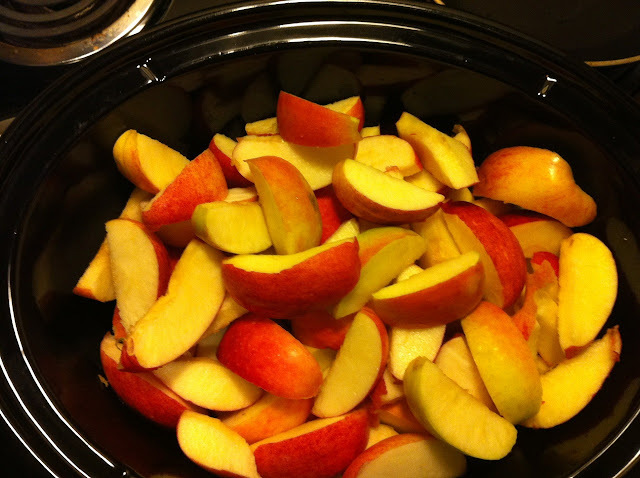 Instead, I cored 5.5 lbs (about 14 apples) and put the slices in the crock pot. Having worked this recipe a couple times, I found it better to heat the apples on low for about 8-10 hours rather than on high for four hours, which is what I read in a few recipes. 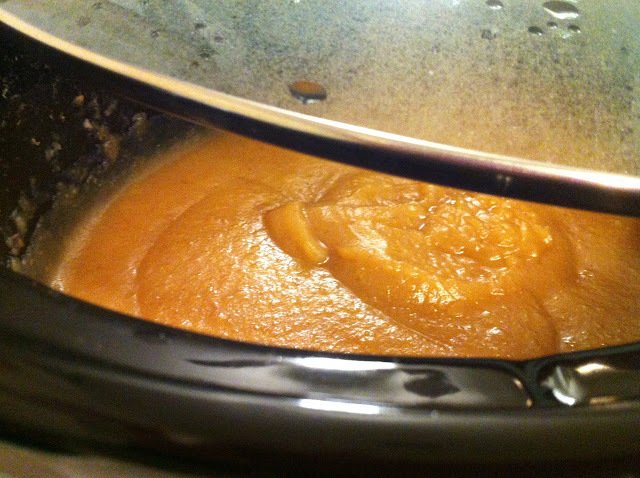 Once the apples become soft, I used a hand held immersion blender to smooth out the apples (You could also use a regular blender by transferring the apples to the blender and then back to the slow cooker). I then added the cinnamon and lemon juice and replaced the lid and continued to cook the apples for another 10 hours. Yes, this really is a long process but the results are amazing and the scent that is left in the house is wonderful. You'll want to invite all of your friends over. Seriously though, the effort is minimal. 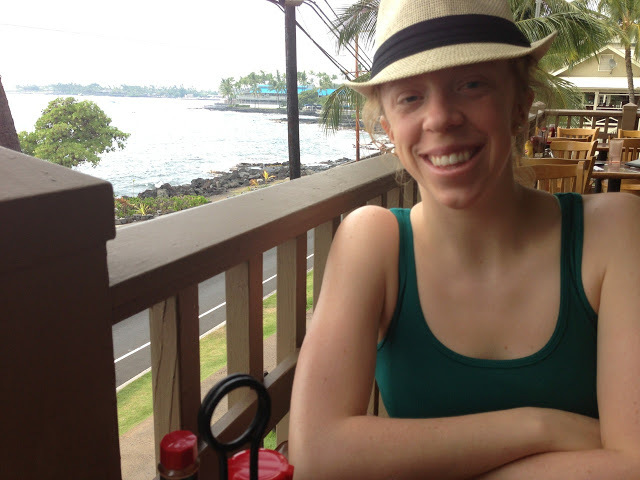 During the first 8-10 hours, I slept and during the next 10 hours, I ran errands around town. When I came home, the butter was super creamy and was deep brown in color. I felt like the butter was condensed enough, but if you wanted to condense the butter even more, you could take the lid off the butter and then turn the slow cooker to high for about 45 minutes to an hour. 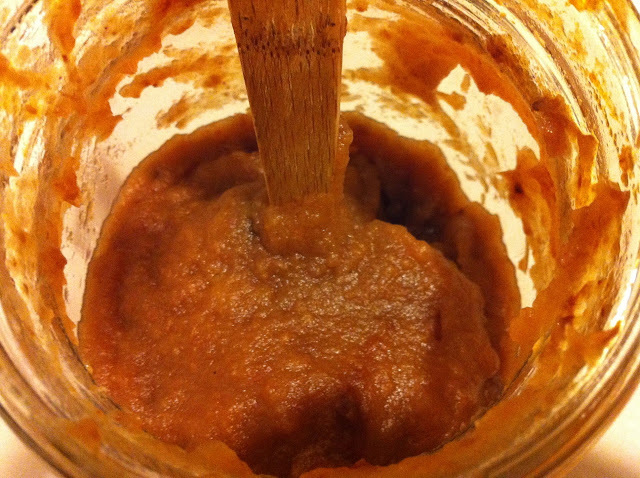 The apple butter is similar to applesauce but with a much smoother consistency and slightly richer taste. Like I mentioned above, the butter tastes excellent on bread. The great thing about apple butter is that it lasts forever in your refrigerator and becomes more rich and thick with time. Don't be scared to try this recipe. This is a great "no added sugar" version of a popular treat.